When someone asks me what they need to do to prepare them for the future of work, I tell them you need to learn how to manage yourself more effectively. 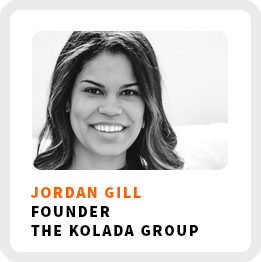 Jordan Gill is going to share loads of insights, tools and tips to help you manage yourself, so you feel less overwhelmed and more confident. Jordan is the founder and operations manager of The Kolada Group, a consultancy to help business owners work smarter, not harder through the implementation of systems. You can also check out her podcast, Systems Saved Me on iTunes or your favorite podcast app. How to find a communication system that works for your needs. Effective methods for establishing expectations with clients and team members to help you manage your time. Why automation is a good thing and how it can keep you sane. Some quick tips for making your inbox a little less overwhelming. Peak performance period: Afternoons between 2:00 and 5:00 and evenings between 10:00 pm and 1:00 am. Core work activities + habits: 1) Review Asana and Slack boards to communicate with her team. 2) Managing and working with clients through intensives or work on content creation. 3) Gratitude journaling in the morning and at night. 1) Listen to what other people are telling you about your strengths and your zone of genius. 2) Think about who you are in your friend group and find a way to use it in a business format.